Stanley and Lenore are about to have a very bad day. Warning! Spoilers ahead. 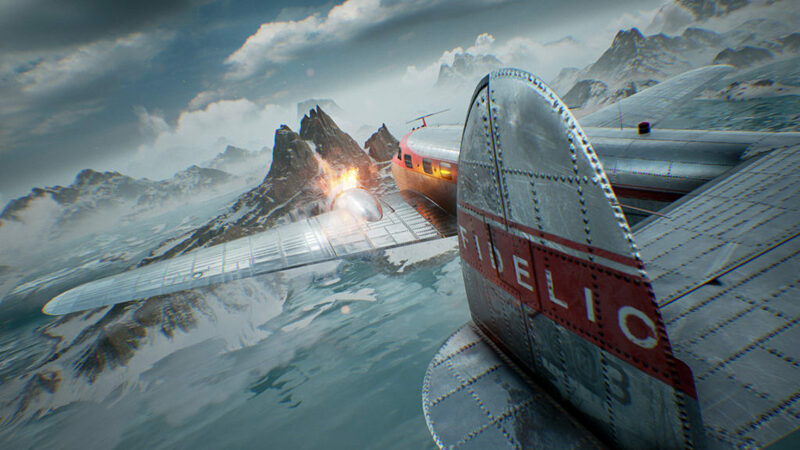 There is a terrifying crash and when Stanley comes to, he realises he’s on a wintery island and the plane has been sheared in half, with the half containing a wounded Lenore on the other side of the mountain they clipped on the way down. Stanley is alone, freezing – and terrified of being discovered. It’s at this point that the game thrusts you into the action. On the strength of the jarring opening alone, The Fidelio Incident had me hooked. 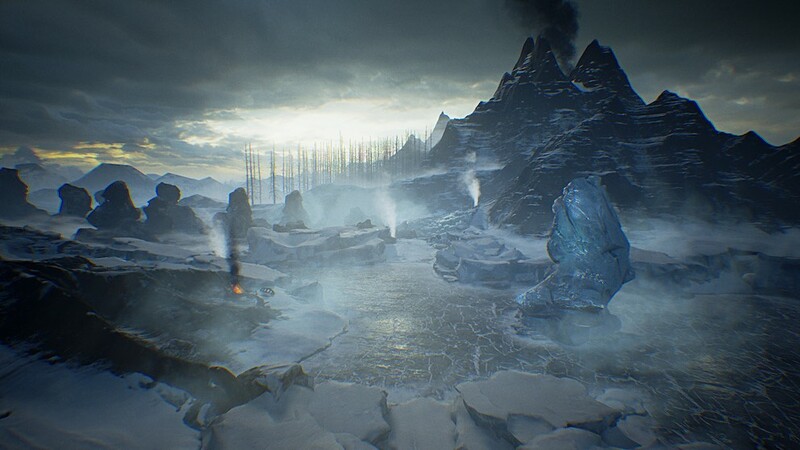 Lovingly rendered using Unreal Engine 4 by Act 3 Games, the deathly cold island the player finds themselves on is just gorgeous, in a deadly kind of way. 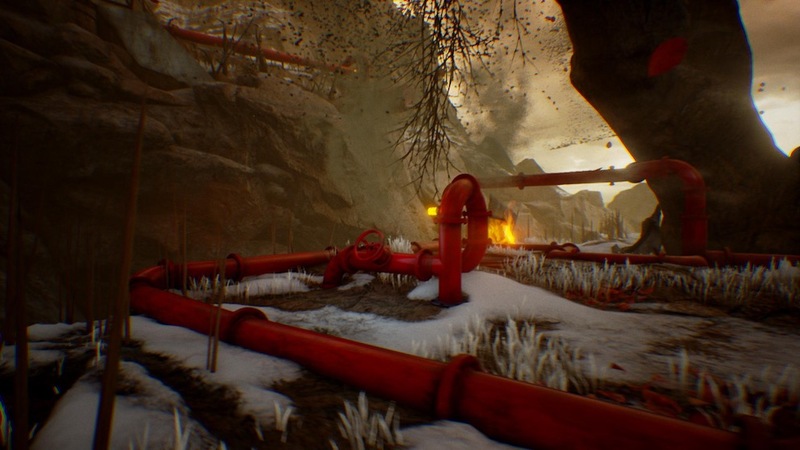 For the first half of this admittedly short game, the map is almost devoid of man-made structures, reinforcing the isolation of the environment. 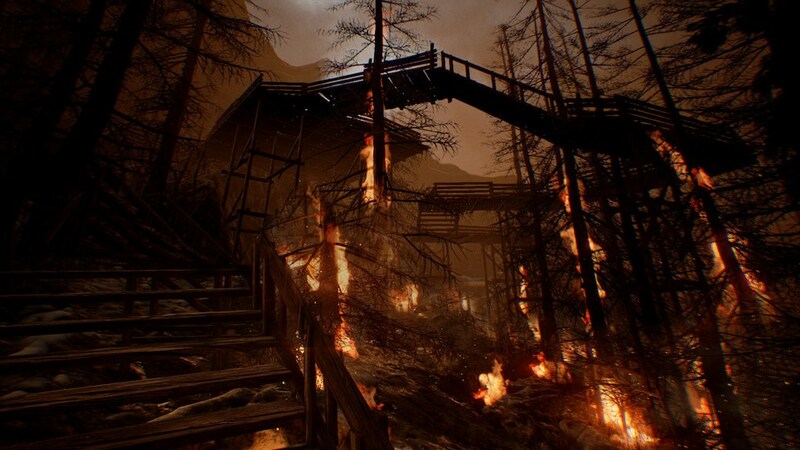 In fact, as a walking simulator enthusiast (or first-person adventure if you will) I would have been happy to just explore the unknown wilderness in front of me. So the player is forced to run from conveniently placed burning debris and steam vents while scouring the tundra for Lenore’s diary. This is where the story suddenly opened up for me. It was less of a story of survival now because, as the pages gradually revealed, Stanley and Lenore are on the run. The Northern Irish brogue that punctuated their pre-crash banter is absolutely deliberate. Suddenly, it stopped being a short adventure game and became a personal and political struggle. Stanley was falsely accused of planting a bomb in Belfast during the Troubles and Lenore broke him out of prison and they’ve been running ever since. The diary pages reveal a forbidden romance between two people whose fathers are on opposite sides of the argument. Lenore’s father was a rabble-rouser; Stanley’s father was peace negotiator. That Stanley and Lenore end up together at all is amazing, but the voice actors give it their all and by game’s end I was totally taken with their playful but dangerous relationship. At the halfway point the player realises that all is not what it seems, however. If you’re a regular tramper (especially in the colder months) you might twig to what’s going on sooner than I did, but at some point, it becomes painfully apparent that Stanley is an unreliable narrator. This was also the point that the story took a turn down Predictability Lane and started to lose me completely. This leads me to the negatives. The game has an experience-destroying bug in the final moments forcing me to watch the ending on YouTube. Other gamers have noted this glitch with similar eye rolling. The puzzles are very light – it’s a real disappointment that the gameplay is nowhere near as strong as the story and the voice acting. It all ends on a bit of a downer, both in story terms and in-game experience. But, despite all this, I recommend this game if for no other reason than it’s a compelling way to learn about one part of the recent past. It’s a pity, however, that technical problems marred the moment.